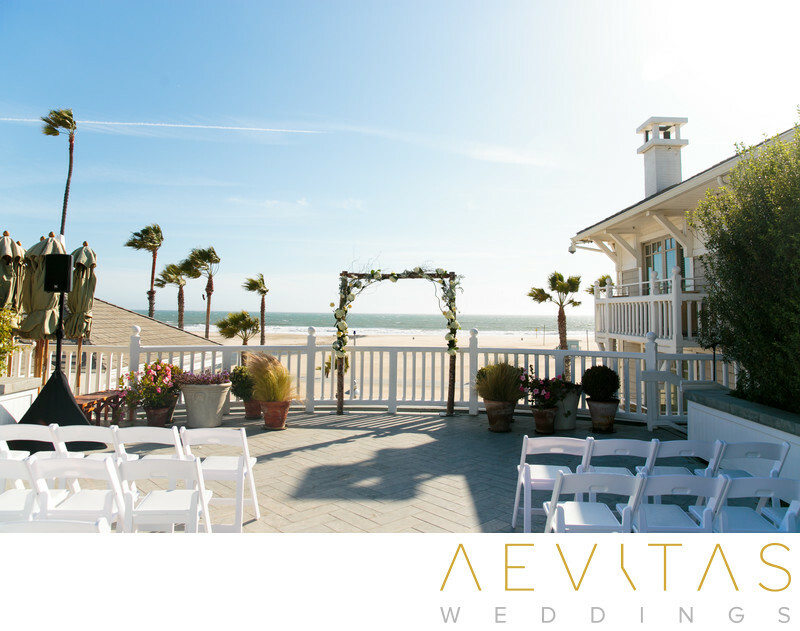 With an enviable, oceanfront address in Santa Monica, Shutters on the Beach is an idyllic one-stop wedding destination for couples wanting the relaxed ambiance of a beach-side setting. From getting ready in one of their spacious suites to partying into the night in one of the multiple event spaces, weddings at Shutters on the Beach are literally a breeze. Ceremonies are held during the magical late afternoon light on their stone-tiled deck, with panoramic ocean views as a backdrop and the capacity to host around 200 guests. After exchanging vows, you can wander the grounds for a dramatic sunset couple portrait session, utilizing the lush greenery and inviting pool as feature elements. Or head down to the soft sands of Santa Monica, with the iconic pier as a backdrop. Shutters on the Beach offers multiple reception spaces, all of which are tastefully decorated in soft pastel colors that provide a neutral backdrop for couples to transform as they desire. You can opt for their luxurious Grand Salon, with a floor-to-ceiling marble mantle and Venetian chandeliers, or have a more intimate celebration in the Promenade Room, with its adjacent outdoor terrace. The stylish Beachside Room can also used for rehearsal dinners, with hardwood floors and stunning views across the sand. All catering and beverage packages are supplied by Shutters on the Beach, with the option to tailor menus to the couple’s requirements. A wedding planner selected from their list of preferred vendors is required to handle all the logistics of your wedding day, and they invite you to personalize the spaces with your own decor and floral arrangements, adding to the already sophisticated and chic furnishings available. After an unforgettable day spent with your family and friends, you can retire to one of Shutters on the Beach resort-like suites. Open fireplaces, marble bath tubs and shuttered doors opening out onto Pacific Coast views will tempt you to start your honeymoon right there and then.